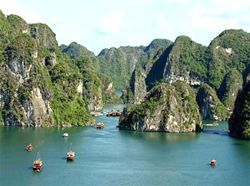 Hanoi – Halong – Sapa 6 days of touring to discover the treasures of Northern Vietnam. The travel includes all of the highlights around Hanoi and its surrounds. We pick you up on arrival at the airport, transfer you to your hotel, and explore Hanoi on a city tour. The next wonderful place is Halong Bay, it is one of seven wonders of the new world, and the closing of experience of this journey takes you to Sapa for two days. Our guide will meet you at the airport and transfer you to your hotel. After lunch, you will visit theTemple of literature, then continue on to visit Museum of Ethnology– the most interesting museum in Hanoi with many different displays relating the 54 Vietnamese ethnic groups. You will visit Hoan Kiem lake (Restore Sword Lake) and the last place of the Hanoi tour is taking a walk to visit the old Quarter of Hanoi and watching a traditional Vietnam water puppet show. Arrive into Halong Bay at midday and transfer to your comfortable junk to begin the cruise around majestic Halong Bay while enjoying a delicious lunch. Explore limestone caves dotted around the bay, or soak up the sun on the top deck. In the evening the chef will prepare a splendid meal comprised of fresh seafood dishes. 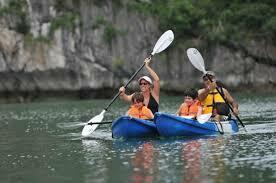 Includes: Transfer, hotel breakfast, lunch, dinner, tour guide, entrance fee, Halong cruise. Enjoy an early morning swim followed by breakfast onboard the junk. On arrival, aroundt 5pm, you will be dropped off, back at your hotel in Hanoi. Travel to Sapa, on the overnight train in a/c 4 berth, soft sleeper cabins . Includes: Transfer, breakfast, lunch, tour guide, entrance fee, Halong cruise, night train to Sapa. Take a guided walk through rice paddies and tiny hill tribe villages.The afternoon will be spent exploring the fabulous markets selling traditional art and crafts, embroidery and silver. 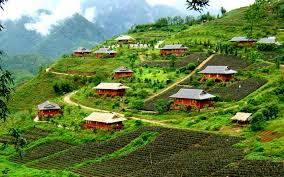 Inclusions: Transfer, hotel breakfast, lunch, tour guide, entrance fee, hotel in Sapa. Inclusions: Transfer, hotel breakfast, lunch, tour guide, entrance fee, Night train to hanoi. Arrive in Hanoi in the early morning and take a short break, shower & enjoy breakfast in a mini–hotel before departing to the airport. You will be transferred to the Hanoi airport for your scheduled onward flight or to continue your journey to visit other cities inVietnam. We hope you enjoyed your journey and see you again. Includes: Transfer, hotel breakfast, tour guide, hotel in the morning. Any services not mentioned in the above list of day inclusions.